Lot 2536. 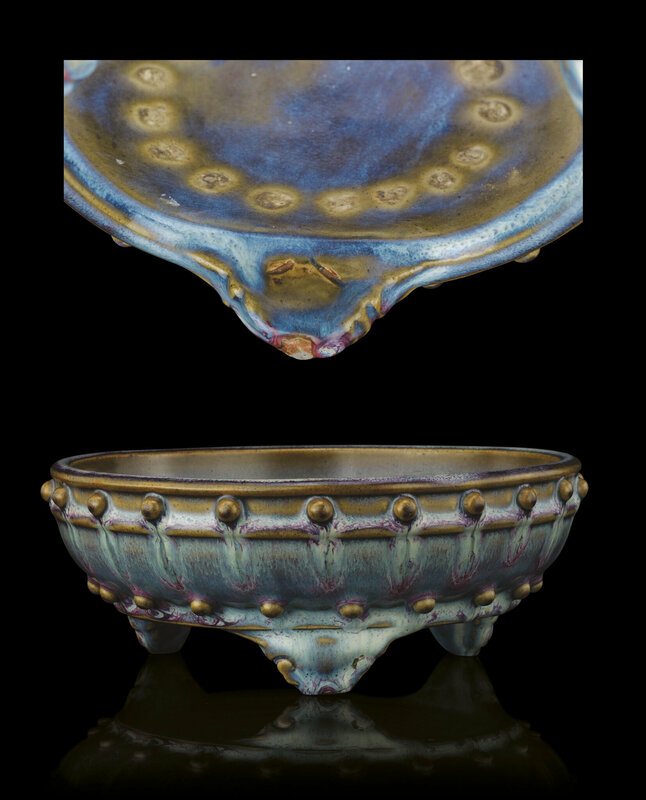 A rare 'numbered' junyao tripod 'narcissus' bowl, Yuan-Early Ming dynasty, 14th-15th century; 7 3/4 in. (19.6 cm.) diam. Estimate HK$400,000 - HK$600,000. Price Realized HK$800,000. © Christie's Image Ltd 2008. The sturdily potted circular bowl is supported on three ruyi feet, the rounded sides decorated with two rows of evenly spaced 'drum-nail' bosses, one within a pair of raised bands between the rim, the other above the feet, covered in pale lavender glaze suffused with areas of purple striations, thinning to an olive-green on extremities, the flat base with a ring of circular spur marks, inscribed on the inner side of one foot with the numeral, ba, 'eight'. Note: The present bowl belongs to a group of Jun wares relating to plant cultivation. These wares are well-made using moulds and each bear a Chinese numeral from one to ten, either incised or stamped on the base before firing. The dating of this group has been controversial since some scholars in China have been inclined to date them to the Song dynasty, while others have suggested a later date. Extensive archaeological and scientific research in China, which was presented at symposia held in 2005 and 2006 has led the majority of scholars to conclude that these fine quality numbered Jun wares must date to the Yuan or early Ming dynasty, late 14th to early 15th century. 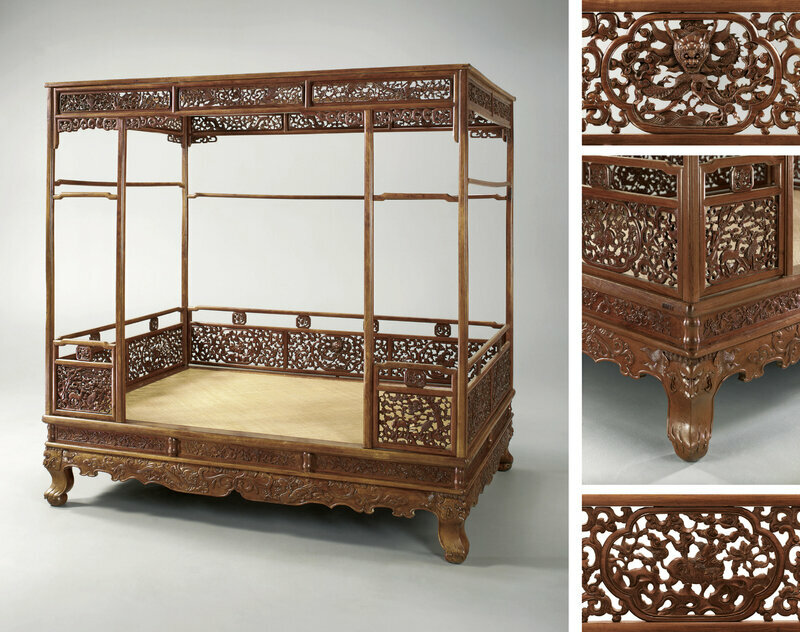 It may be significant that Jun wares do not appear to have been mentioned in Chinese literature before the Ming dynasty but are mentioned with increasing frequency in the latter part of the Ming dynasty. Interestingly, comparisons with ceramics from other kilns, including some excavated from the Imperial Ming kilns at Jingdezhen, suggests that these vessels may have been made for the court in the early Ming dynasty, which would account for the high proportion of extant examples being preserved in the imperial collection. Judging from the extant vessels of this kind, the numbers relate to the size of the vessels. 'Eight' represent the relatively smaller of the range with 'Ten' being the smallest and 'One' the largest. A similar 'drum nail'-shaped example with a purple glaze bearing the 'Eight' numeral on the underside base, rather than the on the interior foot, is illustrated in A Panorama of Ceramics in the Collection of the National Palace Museum Chun Ware, National Palace Museum, 1999, pp. 106-107, no. 36. Other related purple-glazed examples incised with the numeral 'eight' in the National Palace Museum collection are published, see op. cit., pp. 42-43, for an archaistic Zun-shaped vase; pp. 70-71, no. 18, a straight sided flower-pot; and pp. 122-123, no. 44, for a hibiscus-shaped bowl. Christie's. 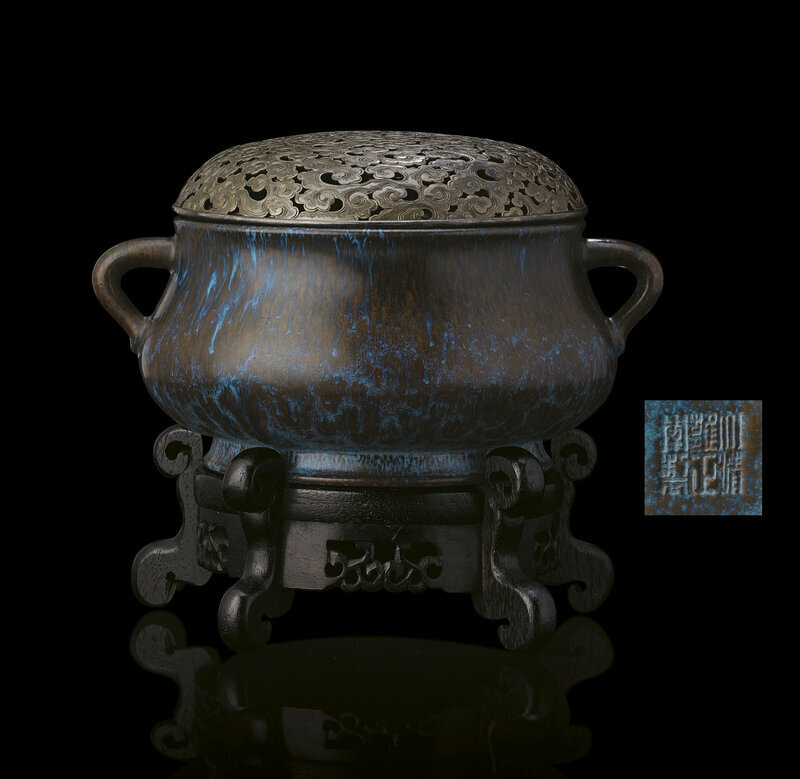 Important Chinese Ceramics and Works of Art. 3 December 2008. Hong Kong.